It has been suggested that this article or section be merged with J2.5:Use Joomla! on your own computer. (Discuss). Proposed since 5 years ago. This article is tagged because it NEEDS TECHNICAL REVIEW. You can help the Joomla! Documentation Wiki by contributing to it. This is the part used in both versions of the 'localhost' document. It just has the part about installing xampp. The Joomla! versions are different. This is the version for installing version 1.7.4. To run Joomla! on a Windows desktop or laptop you need to download and install some software needed by Joomla!. This includes a web server called Apache, a database called mySQL and a scripting language called PHP. The point of this to to configure your own machine to behave as if it were a server with the difference being that the result is not visible over the internet and is thus confined to your own computer. This is very useful for learning new things and even developing a new web site. There is a choice of using an Installer or downloading a ZIP file. 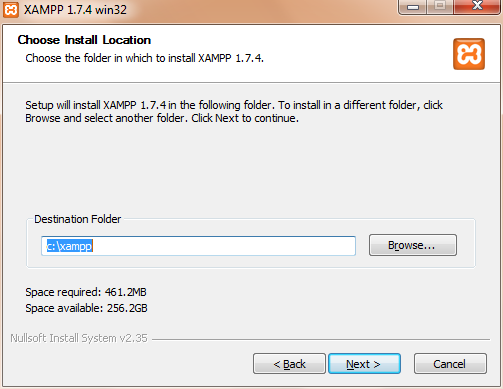 The installer is easier as it extracts the files directly to the XAMPP directory. You need XAMPP Windows (it is followed by a number - currently 1.7.4) There is a short explanation that XAMPP exists in three different flavours. You will be asked to select a langugage. If there is a warning screen about set up in Vista - close it as you are keeping the files somewhere else anyway. The next window is the Welcome screen for the install Wizard. Installation Progress is indicated on the screen. When the files are extracted, a Congratulations screen is shown, which asks whether you want to start the Control Panel. 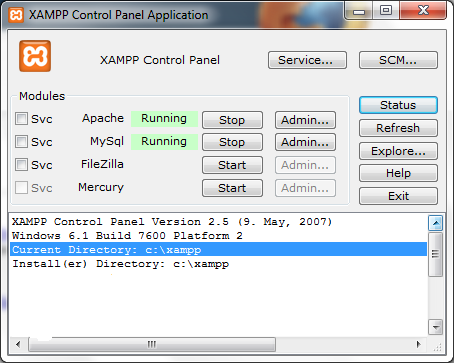 see also the XAMPP documentation at http://www.apachefriends.org/en/xampp-windows.html - scroll down the page to the instructions under the heading Installation. This should allow you to use the Home page of the localhost web site. Make sure you do this before installing anything else. If it has not been successful - you will get a message saying 'Unable to Connect'. The most likely cause is that Apache or mySQL are not running. Use the Control Panel to check these. This page was last modified on 6 June 2013, at 05:02.